The Western Equestrian Team at Syracuse University - made up mostly of ESF students - opened its winter competition season with 10 students winning ribbons and the team as a whole earning honors as reserve high point champion (horse-show parlance for second place) on the first day of showing. "Believe it or not, most of the Western Equestrian Team at Syracuse University is ESF students. We're an official Intercollegiate Horse Show Association (IHSA) team that is open to SU and ESF students," said ESF senior Mikayla Call, a four-year member of the club and its current president. The team practices at Hoyts Training in Manlius, New York, and typically competes in eight shows per regular season, with additional shows starting in March for those who qualify to move on to regionals, semi-finals and nationals. "The team becomes very close, and it's a great way for ESF and SU students to bond. You don't feel like you go to different schools when you're at competitions because you're working together to earn the most points and to place as a team against the other teams," Call said. "And of course, I've met a lot of great horses that I will always remember. I write their name on the back of every ribbon I get so I can remember which horse helped me earn it." Call pointed out the benefits of horseback riding: Studies show that horses can be therapeutic and that being around horses can help reduce stress. 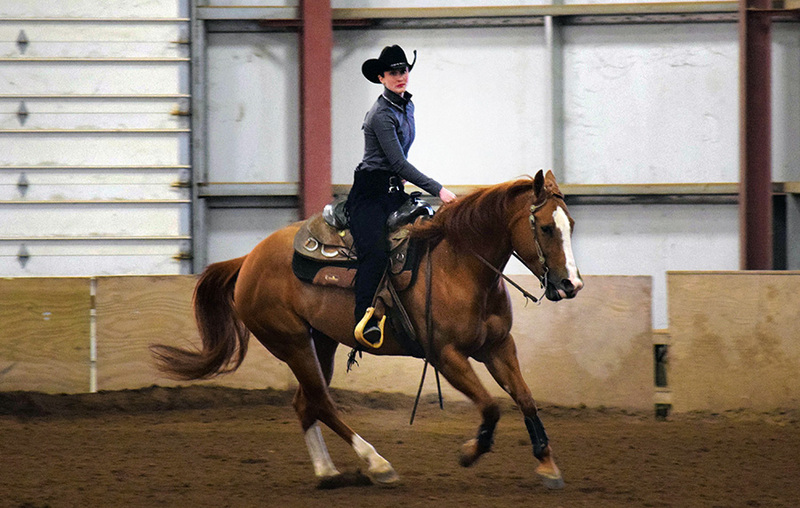 Horsemanship skills help riders increase balance, coordination and confidence. Riders also develop an unusual approach to working as a team. "You're part of a team with the other students, as well as a team with the horse that you're riding with, so it's a unique experience. I appreciate what every student on the team has done to support me, but I also acknowledge that I wouldn't be able to earn the scores that I'm earning if it wasn't for Ruf, Desi, Sabre, Wyatt, Herman, or any of the other horses that I've worked with," Call said. The club offers experienced equestrians a chance to continue riding throughout college, and provides a learning opportunity for beginners. It's one of about 50 sports clubs at Syracuse University that ESF students can join. The first weekend in December, the team members rode in their season opener at Cazenovia College, competing against Cazenovia College, SUNY Oswego and the University of Guelph. There were three competitions over the course of the weekend. Following is a rundown of how the ESF students placed, including each student's class, riding level, and any club positions they hold. Senior Rachel Bonafilia is also a team member, competing in intermediate horsemanship, but she did not ride this weekend.